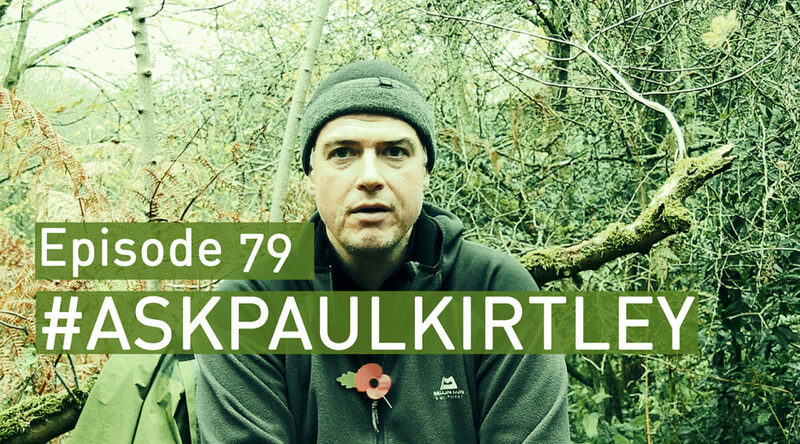 In this episode of #AskPaulKirtley I answer questions about axe stones and keeping them in shape, using a parang in the boreal, quilts vs sleeping bags. demographics of bushcraft course participants, when to use the finer side of a sharpening stone, visiting North American bushcraft festivals and shows. Good decision to streamline your podcast and social media! Would be nice to have a winter skills Q&A in the next months. Really looking forward to the Lou Rudd Episode! In regard to the parang question and the traditional blade rant: on the northern edge of the boreal forest the sami use a traditional large chopping knife, the leuku. Of course deep in the boreal forest is much more useful, but on its northern edge and into the (mountain)tundra a lightweight chopping blade can be useful enough to leave the axe behind. Thanks for your comments. Noted re the winter skills Q&A. Lou Rudd podcast should be out later this week. You make a good point regarding the arge Sami knife (stuorraniibi) selection but this wasn’t the question. But overall, I agree a heavier chopping knife in combination with a lighter companion knife (the classic Sami combination) is useful for cutting brush, branches, batoning, etc. Yes, how dare I talk about web stuff here on the web, especially when it affects loyal viewers, listeners and followers here on the web in how they consume a good amount of my material here on the web? It’s a shame you gave up after 20 minutes, though, as that’s pretty much were the answers to everyone’s questions started. I’m sure you found some more free material to consume, though, likely some other material that they are not charging you for either, that was also created to help you out, with the expectation of nothing in return. Those of us who do this for you really should learn to serve you better. I’ll have a long hard look at myself and make some changes so Rupert is looked after better, even if it is the first time you’ve ever commented on this site. Never mind about me making sure those who spend time consuming a lot of material (on the web) are clear about what’s going to happen, even if they have been visiting this site loyally for years. Apologies if this was an inconvenience for you Rupert. Sorry to go on about “web stuff” again but one suggestion that did immediately spring to mind is you should use capitals and punctuation in the appropriate place when writing on the internet (and in general for that matter). This way you don’t come across like a child or someone who has put so little thought into their comment, they can’t even be bothered to type it out properly. Another piece of advice would be to treat others how you’d like to be treated. If you are dismissive of others and their efforts then see what happens…. You reap what you sow. Excellent answer, but totally not worth it. “Delete comment” might ‘ve been a more appropriate action here (imho) ;-). Hi Paul, I think you’ve nailed it with the change! My 11 year old and I love to watch outdoor youtube but he said the other week “All he does is sit there talking!” pitiful attention span, however this prompted me to consume these as podcasts at work then discuss the pertinent answers with him latter. I know how much we both enjoy your skills based youtube content so alls good. Keep up the great work. I hope you’ll still have a rant when you merge the podcasts I love them. Hi, Paul. I do tend to watch you on the blog rather than YouTube, but will obviously switch to watch you passing on your skills & tips. The merge is practical and sensible, very Paul Kirtley like! Enjoy it all, no matter the medium. Always excellent. Hi Paul, I have had the pleasure of catching up on all your previous episodes in my commute to and from work, from this and your longer format podcast and have thoroughly enjoyed both. I has been great to listen to the guests you have had on and the diverse topics you have introduced me to. I appreciate the enormous amount of work you put in to provide this information to us free of charge. It makes sense to merge the two podcasts and I will continue to look forward to the new episodes coming out. I will also look forward to the new material you plan to post on youtube. As a scout leader I have found the advice you have given in this podcasts an invaluable resource and have learnt a great deal from it and from the content on your web site. Many thanks for all the excellent work, Toby. Although I’m totally with you on optimizing how you convey your knowledge to the wider world, I’ll still be missing these video podcasts. You’re a very expressive guy, and the body language, your “hand language” if I’m allowed :), do add a lot of color and depth to your words. Nevertheless, looking forward to hear you on the podcasts and watch you on YouTube. Already looking forward to the final Ask Paul Kirtley in it’s current form, and wish you all the best in your endevours. Thanks for answering my question about quilts and sleeping bags – your advice was sensible and helpful as always. You’ve given me some things to think carefully about before I make my decision regarding acquiring better quality kit for winter camping. Much appreciated! I liked it to see you sitting on a log. What I learned in several ruck sack forums is, that if you can’t see the gui who gives an information, the information he gives is nearly worth less. Is there writing a 13 years old girl or a 60 years old man??? In real life like in a video people are able to look in the face of the person who gives the information. And when I looked at you for the first time there was no doubt, that you really live outdoors. But I agree, that answering questions can be made easier in the office and that saves time for other higher quality productions. Perhaps you really should better use your time to show people in small videos how things are properly done in the traditional way. For example how to put up and organise a simple bivvy bag – lean to poncho shelter set up with fire and billy can. Stuff like that is missing in the video world. The simple trough stuff is missing. I think, you should concentrate on thinks like this. Approved basics should be taught in my opinion. Perhaps you can find the time to produce some videos like this. I prefere listening You talking 20 minutes about internet stuff than wasting a second in reading comments of disgusting trolls. Thank you for your supportive words and you suggestions regarding material for my YouTube channel, which I like. You make an interesting – and I think valid – point about being able to see the person, rather than just hear them, or even only read their words. Something you could explain in a longer video, what most people do not understand, is about condensation problems. How is a bivvy bag properly used? Problems with bow bivvy bags/ bivvy tents. How does a double wall tent work? When should I open the door, and when should I close it??? Is it a good idea to fold the ground sheet out of a large Tarp an put a sleeping bag without bivvy bag in the corner??? A lot of videos in the internet show that possibility! Nobody tells about lakes under the sleeping bag. Fire in front of lean to shelters to avoid condensation. Do candles help and how to use them and when shouldn’t we do this. When falls the dew out and why, and how long? In the morning or in the night or in the evening or all the time??? Why did my in the afternoon rolled out sleeping bag become whet in the tent, while I was sitting next to the fire outside? The bag of my friend who was in his tent stood dry!!! People don’t know it, even if they where camping a lot. And the old foxes who know every thing else often used to use cotton tents. Even they often have no idea, what’s going on! Condensation of breathing air, sweat and dew are one of the last big miracles in the world of wild camping. To explain all this would be interesting for a lot of people.